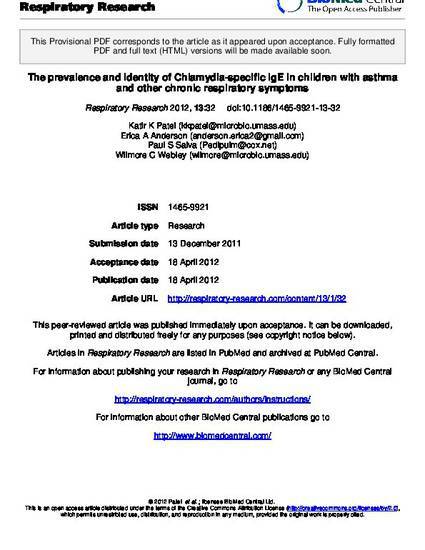 Background Recent studies have confirmed the presence of viable Chlamydia in the bronchoalveolar lavage (BAL) fluid of pediatric patients with airway hyperresponsiveness. While specific IgG and IgM responses to C. pneumoniae are well described, the response and potential contribution of Ag-specific IgE are not known. The current study sought to determine if infection with Chlamydia triggers the production of pathogen-specific IgE in children with chronic respiratory diseases which might contribute to inflammation and pathology. Methods We obtained BAL fluid and serum from pediatric respiratory disease patients who were generally unresponsive to corticosteroid treatment as well as sera from age-matched control patients who saw their doctor for wellness checkups. Chlamydia-specific IgE was isolated from BAL and serum samples and their specificity determined by Western blot techniques. The presence of Chlamydia was confirmed by species-specific PCR and BAL culture assays. Results Chlamydial DNA was detected in the BAL fluid of 134/197 (68%) patients. Total IgE increased with age until 15 years old and then decreased. Chlamydia-specific IgE was detected in the serum and/or BAL of 107/197 (54%) patients suffering from chronic respiratory disease, but in none of the 35 healthy control sera (p < 0.0001). Of the 74 BAL culture-positive patients, 68 (91.9%, p = 0.0001) tested positive for Chlamydia-specific IgE. Asthmatic patients had significantly higher IgE levels compared to non-asthmatics (p = 0.0001). Patients who were positive for Chlamydia DNA or culture had significantly higher levels of serum IgE compared to negative patients (p = 0.0071 and p = 0.0001 respectively). Only 6 chlamydial antigens induced Chlamydia-specific IgE and patients with C. pneumoniae-specific IgE had significantly greater levels of total IgE compared to C. pneumoniae-specific IgE negative ones (p = 0.0001). Conclusions IgE antibodies play a central role in allergic inflammation; therefore production of Chlamydia-specific IgE may prove significant in the exacerbation of chronic, allergic airway diseases, thus highlighting a direct role for Chlamydia in asthma pathogenesis.